Aspiring freelance writer living in Brisbane and attending the University of Queensland at St. Lucia. If you're looking for a truly atmospheric place to set back a few drinks, sit down to a quality meal or enjoy the game with a few mates, then there's simply nowhere better in Surfers Paradise than Waxy's Irish Pub. Located just a street away from the bustling hub of Gold Coast Nightlife, Waxy's offers a break from the usual neon and strobes by giving off a classic pub vibe. The prices here are all about average for a night spot, and the food is amazing. Of particular note are the deals on Sunday nights, $2 rump streaks with the option of $2 sauce or chips, all alongside $2 Buddweisers imported straight from the USA. Obviously, the place get pretty busy on a Sunday night so make sure you get in early to grab a spot. 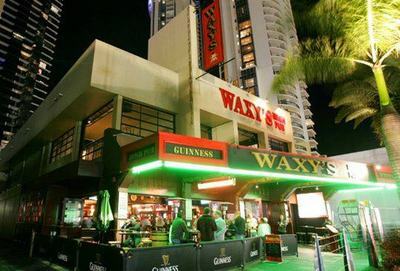 Either way, I strongly suggest that for a good location and vibe, as well as drinks and food that will send your senses back to the Emerald Isles, you hit up Waxy's Irish Pub of Surfers Paradise, Gold Coast, Queensland.